Two big events are just around the corner with SSA! Check out the great Legal Seminar Promo that U-Haul Self Storage Affiliate Network has e-blasted to their contacts! If you haven't registered for the Legal Seminar there's still time! Pre-register and pay online for a discount! Can a K-9 Unit really improve security at your facility? We'll be having this discussion and more at our 6th Annual Legal Seminar on October 14th in Murfreesboro. Make plans now to attend this day-long event! Click here for early registration and save! To read more about the idea of K-9 units at your facility check out the link for the article from the selfstorage.com blog below. Can a K-9 Unit Improve Security at Your Storage Facility? On May 4th, 2014, Stephanie Tharpe received an email she had been hoping for. Stephanie has been in the moving and storage industry since 1996. She joined A+ Storage of Tennessee, LLC in 2010 as a site manager and was promoted in 2013 to full time District Sales Manager. Her accomplishments include serving as a Moderator for Self Storage Talk (SST), the industry’s largest online community. She has been a featured blogger for Inside Self Storage (ISS) and a contributor for the Tennessee Self Storage Association Newsletter. Stephanie was in the top three submissions for the “Best in Self Storage” Marketing contest in 2009 and was featured in the ISS Magazine. 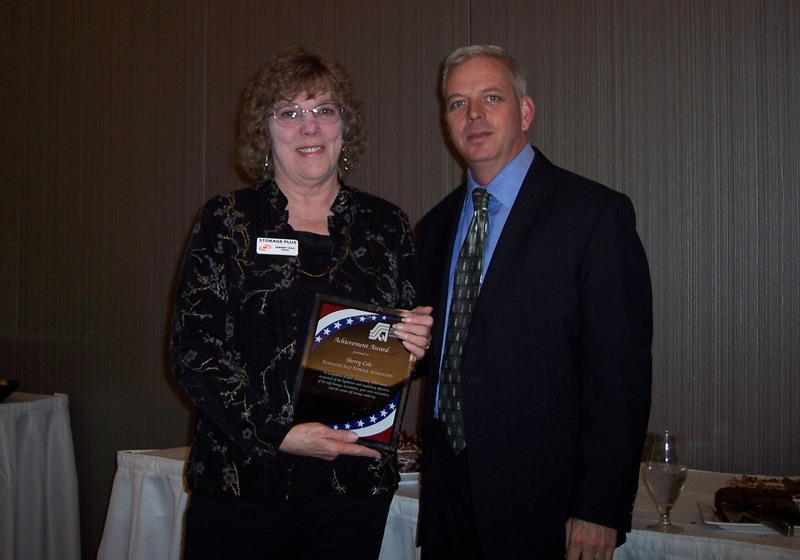 In 2012 Stephanie was honored by the Tennessee Self Storage Association (TNSSA) as its Manager of the Year. And in 2014, she was a featured speaker at the ISS World Expo sponsored by Inside Self Storage in Las Vegas. The accomplishments of her staff include Betsi Jackson, Manager of A+ Storage Fortress, who was named the 2013 TNSSA Manager of the Year. J.B. Sills, Manager of A+ Storage in Spring Hill, won a contest sponsored by Chateau Products and Virgo Publishing for his community service. He was awarded a free trip to Las Vegas for the Spring ISS Trade Show in 2014. In 2010 she implemented an Annual Award Ceremony for her staff. With 16 years in the industry; her passion is to focus on the accomplishments, education and needs of property managers. The 2014 SSA Fall Conference is September 9 – 12, 2014 and will be held at Caesar’s Palace in Las Vegas. There are currently early bird discounts being offered. Visit http://www.selfstorageevents.org/index.php to register. Details of Stephanie’s Session time and date will be in our next newsletter. Southeast Management Company, a third party management & consulting company and owner of storage facilities in the southeastern US, held its 3rd annual team member retreat in Florence, SC on February 21st and 22nd. The event included a social get-together on Friday evening and a full day of team building meetings on Saturday. This year's event featured an interactive speaker on Saturday assisting the team members in expanding Southeast Management Company's culture and style in better recognizing the customer’s storage experience. Recent trends by many storage facilities using remote call centers and web-based customer interaction create the possibility of reducing customer satisfaction and personal assistance. Southeast Management Company is dedicated to providing the best customer service and is implementing a number of new procedures and policies to enhance the experience of our customers. This year's event was centered on the theme of "Listen 2014" stressing the desire and goal to make sure each and every customer has a positive experience with assurances that the customer's needs are always taken care of in a pleasant and fulfilling manner. The meetings concluded on Saturday with an awards presentation to individual team members for their significant achievements in performance in 2013. Southeast Management Company is Virginia based with a regional office in North Carolina and currently manages and owns storage facilities from Virginia to Florida. The company stresses team member empowerment and confidence so each and every member feels appreciated and is provided the tools to reach and obtain their personal goals. To learn about our consulting services, property management services or employment opportunies, please visit our website at www.southeastmanagementcompany.com. or call March Chase, VP of Operations, at 804-436-2596. The Self Storage Valuation & Acquisition Course ~ Register by March 14th & Save!! Valuation & Acquisition Course is Back! J.B. is the winner of this year's "Loving Las Vegas" essay contest, sponsored by Chateau Products Inc.! Click Here to view the official announcement and J.B.'s winning essay entry! Tim Dietz, SSA Sr VP - Communications & Government Relations made a surprise visit at our 1st Quarter Luncheon in Chattanooga on Tuesday. As it turns out, he was there to honor our very own Sherry Cole! Sherry, who has served as our Legislative Committee Chairperson for several years now, was instrumental in the development of the new Tennessee Lien Laws that were enacted in 2011. She put in countless volunteer hours revising our then 30-year-old laws into what we use today. Not only do our new laws provide considerable cost-saving changes for our owner/operators but it also simplifies the lien procedures and brings clarification to the many gray ares of the old law. Our new lien laws now serve as a guide to other states as they work to make similar changes in their current laws. We greatly appreciate Sherry and all of the hard work and dedication that she continues to give to our association! Congratulations to Sherry for this achievement award!!! Tennessee Self Storage Association member, Absolute Storage Management (ASM), completed the installation of a 117-module, 28 kilowatt (kW) solar array atop its Midtown Vault Self Storage location in downtown Memphis. The addition of the solar panels will help offset a portion of the building’s monthly operating costs, with an expected return on investment of less than seven years. Tennessee Self Storage Association member, LightWave Solar, designed and installed the project and connected it to the MLGW power grid on November 30, 2012. Founded in Nashville, LightWave Solar expanded its offices into Memphis last year when they began working on the Agricenter’s megawatt solar project. Since then there has been significant solar growth in the area. ASM took advantage of several incentive programs to help offset the cost of the panels, including a 30 percent federal tax credit, MACRS accelerated depreciation, and an energy buyback incentive from the Tennessee Valley Authority (TVA). As part of the TVA Green Power Providers program, TVA will purchase 100 percent of the solar electricity generated at 9 cents above the retail rate, totaling about 19 cents per kilowatt-hour. The 28 kW system at Midtown Vault will generate approximately 35,000 kilowatt-hours per year, amounting to $7,700 per year at current electric rates. As electric rates increase, so will the income from the solar. Midtown Vault signed up for TVA’s program last year, so the company receives a 12 cent premium for their solar electricity. Green Power Providers applications approved this year will receive the 9 cent premium. However, program capacity is limited to 7.5 megawatts for 2013, and TVA has already received applications for 20% of program capacity. The photovoltaic panels are the latest upgrade to the facility, a former telephone-switch building that had sat vacant and decaying for 15 years. Since purchasing the property in 2006, ASM has refurbished the structure and improved the perimeter while maintaining its historic façade. The building houses more than 400 climate-controlled storage units ranging in size from five-by-five to 12-by-20. The new solar array takes up about one-third of Midtown Vault's roof, allowing for future expansion. The facility is ASM’s second property to employ solar power. East Nashville Self Storage features a similarly sized array. For more information on solar energy, visit www.LightWaveSolar.com or contact Peter Calandruccio at 901-573-2167 or pcalandruccio@lightwavesolar.com. LightWave Solar is the largest area installer of residential and commercial solar PV systems in Tennessee with offices in Nashville, Memphis and Johnson City. Founded in 2006 LightWave Solar has designed and installed over 250 solar projects across the state, including the 1 megawatt system at the Memphis Agricenter. Visit www.lightwavesolar.com to learn more. Founded and based in Memphis since 2003, ASM manages 70 self-storage facilities across the Southeast, encompassing more than 3.5 million square feet. Properties are in Alabama, Georgia, Kentucky, Louisiana, Maryland, Mississippi, North Carolina, South Carolina, Tennessee and Virginia. Visit www.absolutmgmt.com to learn more.